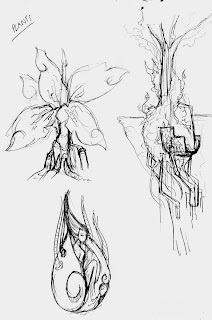 These are some rough sketches I have but they don't have any story behind and that make them incomplete. 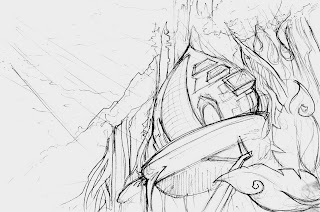 So new Himmapan matte painting's sketches will based on Thai literatures that involved with Himmapan forest instead. One of the most classic story about Himmapan is Phra Suthon Manohra. This ancient literature was written in Ayutthaya period by an anonymous author, believed that it came from Jataka tales. 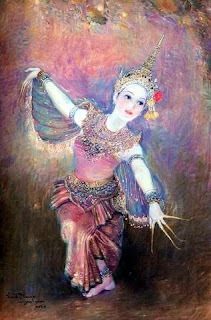 Originating in India, Jataka is regarded as a great source of traditional tales in Asian countries, including Thailand. Jataka is series of religious stories involved with Buddhism believes portray about Buddha's former lives. 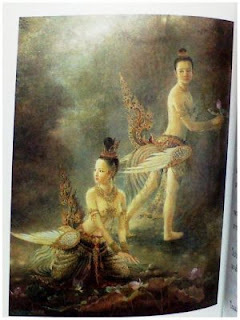 However, in my opinion, Phra Suthon Manohra story is more like fantasy fairy tales. Phra Suthon Manohra is a romantic fantasy story about a prince (Phra Suthon) of Panjalanakorn, who falls in love with Himmapan's exquisite creature, Kinaree (female half-human, half-bird creature), name Manohra. Unfortunately, they are separated from each other. Since there are conflicts and chaos occurs in Panjalanakorn and Manohra is blamed as a cause of all problem, so that the high court decides to sacrifice her, luckily, she can escape. 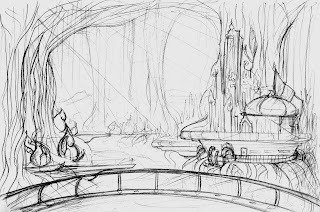 As a result, Phra Suthon travels to Himmapan forest to get his lover back.